Where Did That Week Go! Well as we know, Wirral Council is now Conservative led for the first time in 24 years. Wirral Conservatives and Wirral Liberal Democrats joined together in a ‘Progressive Partnership Coalition’. I have been appointed as Cabinet Member for Housing and Community Safety, and from Tuesday morning onwards it has been meeting after meeting as I get to grips with my new role. Please don’t misunderstand me, I am delighted with the challenges the role brings, and I will do my very best to serve all the people of Wirral to deliver world class services. 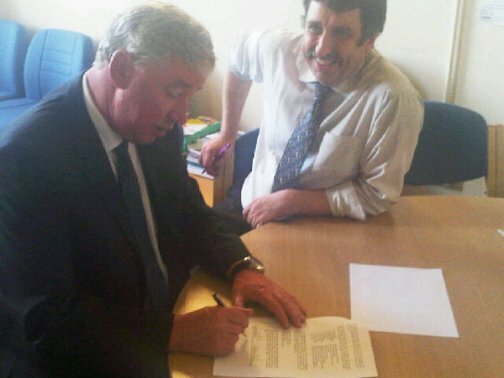 Last night, after 24 years of a Labour led Council, the Conservatives and the Liberal Democrats joined forces in a ‘Progressive Partnership’ to wrest control of the Council. Conservative Councillor Jeff Green was elected as leader for four years under the new governance arrangements. The new local coalition also reflects what’s happening nationally. Believe it or not, it is the first Conservative-led Council in Wirral for 24 years. Conservatives hold 7 of the 10 Cabinet portfolios, the Lib Dems hold 3. The Lib Dems do NOT have the leisure and libraries portfolio. We will ensure greater involvement with people on key issues. I have heard today that former Labour Councillor and Mayor of Wirral, Ken Fox, has passed away. Ken was one of the most respected councillors Leasowe, and indeed Wirral has ever had, sadly he was not treated well by his (Militant) party towards the end of his term as a Councilllor. Ken was always kind and considerate to everyone, regardless of their politics. One of lifes real gentlemen. I would bump into Ken quite often around Moreton, and he would always show an interest in what was going on locally and in the Council. I understand that Ken was one of the longest serving councillors for Leasowe and was Wirral’s second mayor from 1975-76 and, during his year, opened the Birkenhead Shopping Precinct. I last saw Ken on Monday, at the installation of the new Mayor and he was, proudly wearing his Past Mayor’s Badge and a huge smile, as he always seemed to do on these occasions. Ken was very active at his local church, Christchurch and, as with his politics, was respected and like by everyone. Our condolences to his friends and family at this very sad time. Sorry does not Cut it! Thousands of people in the Moreton and Leasowe area had their water supplies cut off at 8pm last night without any notification by the ‘Giant that is United Utilities’ (UU). Some like me have been lucky and have their water supply restored, yet thousands, including schools, businesses and many of the most vulnerable in our society are still without water. 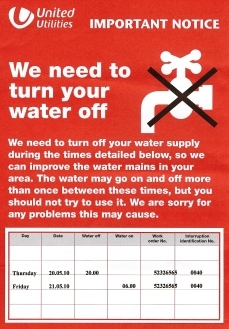 UU promised us that if are water supply was to be off for a major repair we would be notified by having a card (like the one on the left) delivered to us, yet we know learn that 6,000 homes were not carded, yet lost their water supply without that warning, and therefore were not prepared! Last night I tried to get hold of a UU senior manager, but sadly all I got was fobbed off by the Call Centre, dont get me wrong the operator was very polite and very professional, but would not let me speak to a senoir manager. This morning I received a call from their ‘Complaints Escalation Department’ (Seems senior managers are still hiding from me) and all I could get was a sorry. Well UU heres a message for you, SORRY is simply not acceptable. I would have thought that in the 21st century, a company such as UU, who make millions of £’s profit year on year with their exhorbitant water charges would be able to act in a more professional manner. Seems to me that all they are interested in is profit at the expense of their customer, and when it goes wrong they simply say sorry and thats it! It’s time this out of control giant known as UU was held to account, they simply cannot continue to do what they want at the expense of us, after all we pay huge amounts for this service! Earlier this week, along with the other Wallasey Councillors I was notified, via email, by United Utilities Public Affairs Manager that due to a water mains repair in Reeds Lane, thousands of homes would be without water from 8pm tonight (Thursday 20th May) until 6am in the morning. We were all told in that email that: “Notices will be delivered to properties affected by the shut off.” Well that was totally untrue! I did not receive a card, neither did hundreds, if not thousands of people who live in this area, so no one in this area thought they were going to be affected by the shut off, and did not take precautions to fill kettles etc . How wrong we all were, yep our water has gone off as well. I will manage, but I fear for the elderly and the vulnerable who will have no water, who worry about their central heating systems, who wont be able to have a hot drink, or flush their toilets, simply because United Utilities failed to keep their promise to notify people. I called the hotline number to be told that they did not think the shut off would affect us! Are they really so naive that they think they will believe them. When I asked to speak to a senior manager I was told none were available, when I suggested that they contact one they said they did not have contact numbers? What a disgraceful kop out, what a disgraceful and dismissive way to deal with people, what a totally uncaring outfit they are. They really should hang their heads in shame. I have telephoned Dave Green (the Councils Director of Technical Services) at home, and asked that he writes to UU’s Chief Executive asking for a full explanation of what has gone on. I will also be asking the relevant Council Overview and Scrutiny Committee to call UU in and hold them to account over this disgraceful and unacceptable situation. This morning it was over to the Cruise Liner Terminal in Liverpool to watch the Merseyside Fire and Rescue Service and other emergency services, including RAF Valley Sea King Helicopter carry out ‘Operation Manta’. The operation simulated a fire on board the Mersey Ferry ‘Snowdrop’ and once called in, all the emergency services sprang into action, launches, jet skis, water canon, helicopter, the works. What a great performance, and if there ever is a need for a response, it could not be better than from from MF&RS. Well done to all the services who took part. This morning I received a pre-application consultation letter from Mono Consultants who are acting on behalf of O2 and Vodafone. It seems they want to erect a 13.8 metre mast on Hoylake Road opposite the junction with Rosslyn Drive. I have respopnded saying this is an inappropriate location. Let’s hope they don’t submit an application. If they do I will support residents in opposing it. Watch this space.